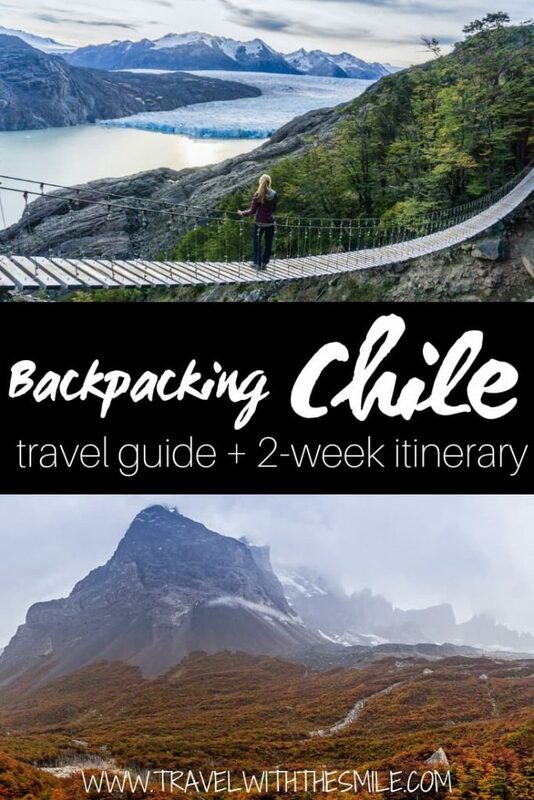 From the driest place on Earth to the endless amount of glaciers, you can find it all while backpacking Chile. 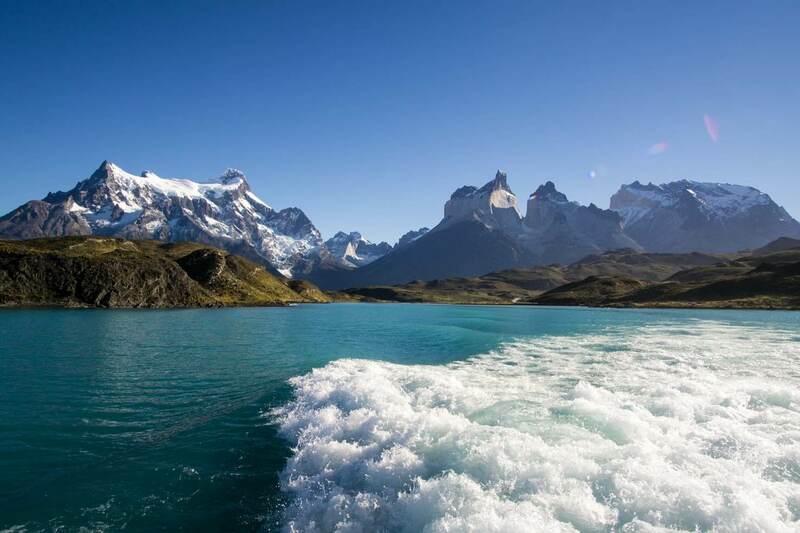 This South American country is mostly known for Patagonia, one of the most beautiful mountainous regions in the world. 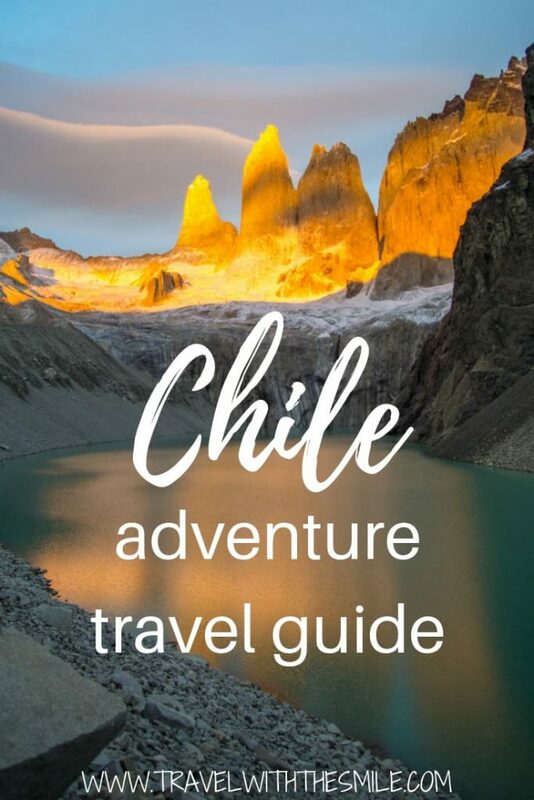 This guide offers everything you should know about Chile and a suggested Chile itinerary for 2 weeks. Chile (together with Argentina) feels a lot different than the rest of South America. While many countries of Latin America have similar cultural elements such as Mayan & Incan ruins and traditional clothing, Chile is completely different. I’m pretty sure you’ll feel the same as we did and think you arrived in Europe. Its capital, Santiago, was designed by a French architect so buildings and streets have a European feel. You will find many German towns in Chile and also the best pastries in South America (otherwise found in European bakeries). After 6 weeks backpacking through the country, we have many tips and insights that we want to share with you and help you plan your adventure. It is focused on the great outdoors, something you might be already familiar with on our blog. 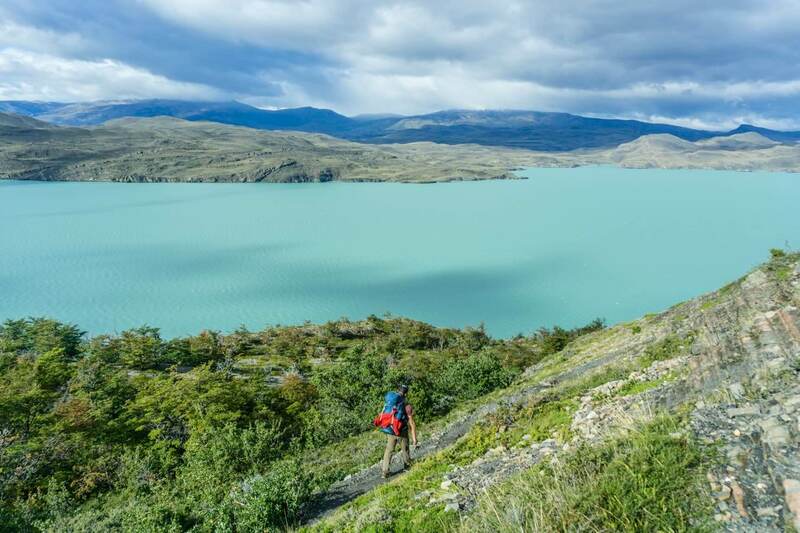 You will find that Chile is an amazing outdoor destination that will exceed your expectations. Chile is a very thin but long country and has many different climates. North of Chile where the Atacama Desert is, the driest place on Earth, is obviously hot and dry. 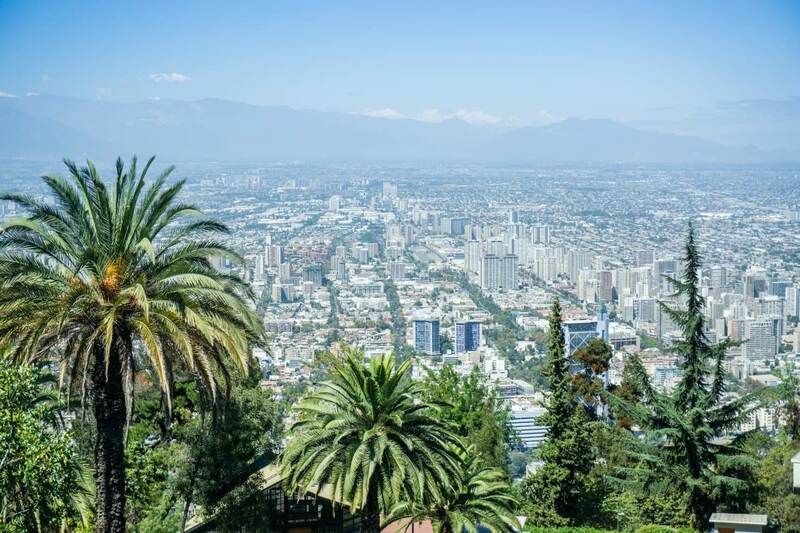 Central Chile, around capital Santiago, has warm (Mediterranean) climate. The area this guide is focused on starts in the south, in Puerto Montt. It’s the beginning of Patagonia with many mountains and fjords. As any coast, it can get quite rainy and windy. Otherwise, it’s not much different from any other mountainous part in the US or Europe. Although some complain about strong Patagonian winds, we found the winds to be the same as other mountains have. What you might not realize at first is that Chile is located on the southern hemisphere. Their summer is December – February,and winter in June – August. This makes it a perfect winter getaway! So when is the best time to visit Chile? I usually suggest spring or autumn due to fewer crowds, fewer issues with booking accommodation and more budget-friendly prices. We’ve visited in April (late autumn) and experienced exactly that plus all four seasons. As far as visas go, it couldn’t be any simpler. There are no tourist visas required, as of December 2018. You will get a visa stamp valid for 90 days on arrival. It applies to most countries (including the US, Canada, EU). If you want to get to know the local people and their culture, or just simply buy a bus ticket without any hassle, learn a bit of Spanish. A good start is learning these basic phrases. I’ve learned some Spanish with apps Memrise and Duolingo. They have Spanish classes set up in a unique way, focused on communicating as soon as possible rather than memorizing vocabulary. All it takes is 10 minutes a day and you’ll be able to communicate very fast. Spanish is very easy to learn! 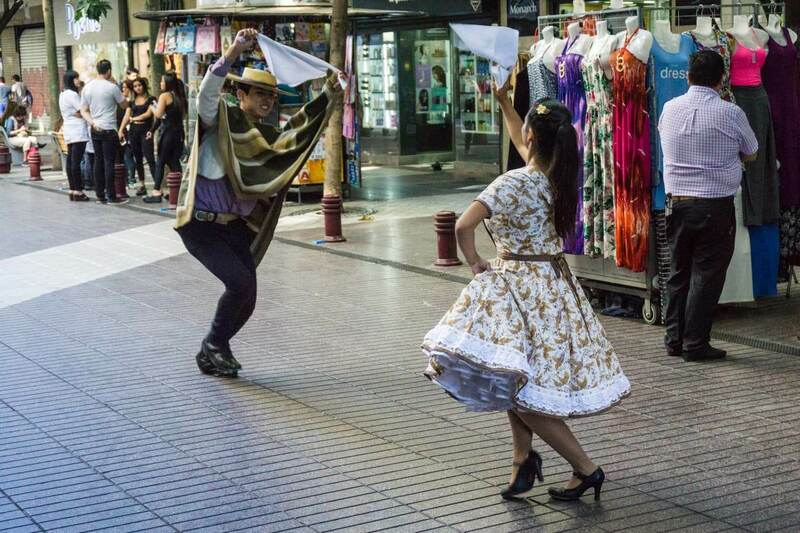 After traveling in Peru and Bolivia, we’ve noticed the Chilean culture is not typically Hispanic. And as I already mentioned, it’s very European so locals are not wearing any traditional colorful clothes. You might rather observe the architecture here or cultural tradition of Chilean huasos (horsemen similar to North America cowboys). Few weeks before your trip, visit a travel clinic to ask about recommended vaccines based on the current situation in Chile. There are no mandatory vaccines required to enter the country (as opposed to mandatory yellow fever vaccine in Peru). Recommended vaccines for Chile include Typhoid, Hepatitis A,and Hepatitis B. Some of them need a longer time to become effective or have to be given in doses to provide protection so the sooner you visit a doctor the better. 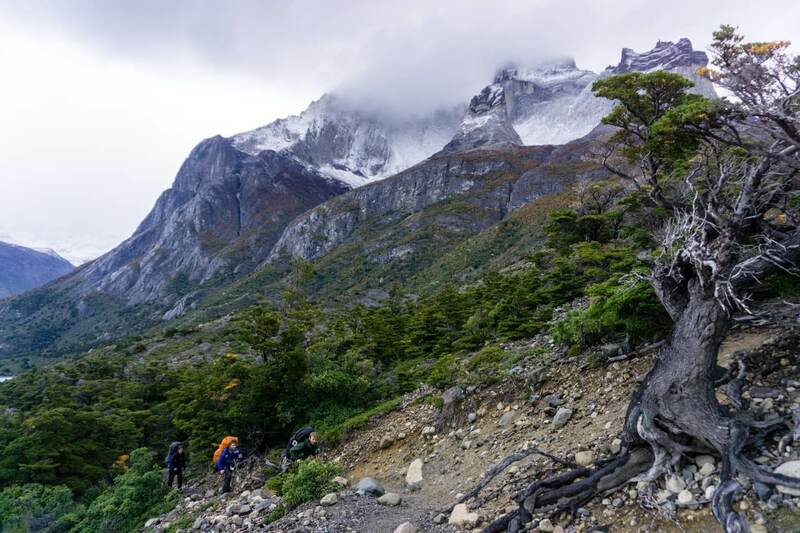 The good news is, the mountains in Patagonia (or in our itinerary specifically) are also quite small so you do not need acclimatization when you arrive or a special health insurance for high altitudes. You will unlikely go higher than 2,000 meters. Unlike most countries of South America, the tap water in Chile is considered safe to drink. Patagonia is also one of the cleanest sources of water but you must know where to drink from in the mountains. The water in the most popular Torres del Paine National Park was considered safe but since it is so crowded with people and animals (horses and mice); I wouldn’t recommend drinking from its water sources. You might be fine but you might also get very sick, read Michal’s post about getting beaver fever. 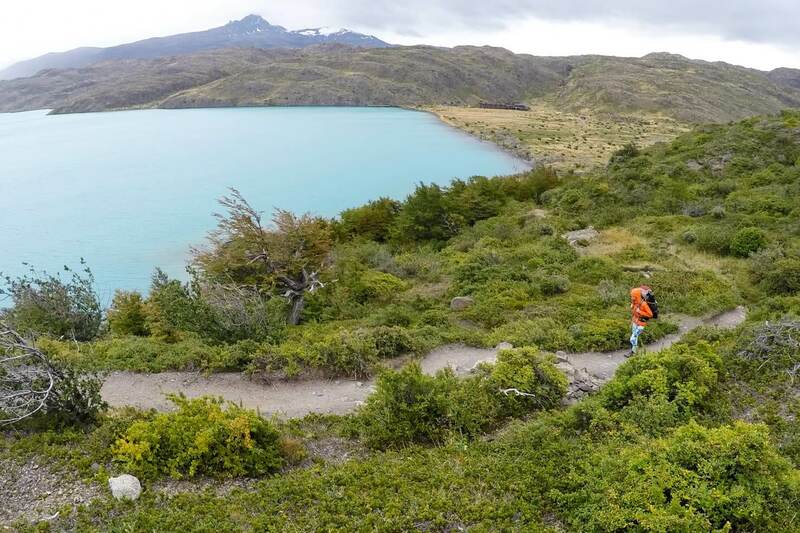 Apart from the trek in Torres del Paine, we always use our Lifestraw bottles with a filter to fill up with water wherever we go or drink boiled water on the treks. We highly recommend having good travel insurance. Better be safe than sorry. As an example, Michal’s beaver fever was treated in New Zealand where medication is quite expensive. We were glad to have a travel insurance that covered the treatment. Overland travelers usually enter Chile from Peru or more commonly from Bolivia as part of the Salt Flats tour that starts in Bolivia. Most travelers will fly into Santiago’s international airport, Chile’s capital. When leaving San Pedro de Atacama, you have 2 options. You can either fly from the nearest city Calama (book in advance due to very high prices) or go by long-distance buses. For anyone not traveling in long-distance buses before, I have very good news for you. Don’t worry if your journey will take 12 hours or longer, Chilean buses are the most comfortable buses we’ve ever traveled in and even more comfortable than planes. Uber is popular and widely used in Chile and more affordable than a taxi. Just download the app and wait for the car in front of ‘Arrivals’, the fare will cost around 10,000CLP (15USD). Buses are another option, either Centropuerto or TurBus. Centropuerto buses leave the airport every 10 minutes between 6am and 11:30pm and have stops near popular train stations in Santiago. Ticket costs 1,800CLP (2,70USD) and can be purchased on the bus. TurBus have buses leaving the airport every 20 minutes from 5am to midnight and every hour after midnight, the cost is 1,700CLP (2,60USD). Even though you can fly between cities, it’s always worth it to check the buses, especially if you travel on a budget like we were. If your trip is planned in advance, then flights would be the best option. Because bus travel in Chile can be very long, just look at the map. Most commonly used companies are Pullman and TurBus but there are many more. To compare bus prices and reserve your tickets online, go to this website for most bus companies or to TurBus website (in Spanish only). They offer reclining seats (semi-cama) or fully reclining seats (cama, 180°). When we were ready to leave San Pedro de Atacama, the flight to Santiago was 200USD in 3 days (the cheapest) or 50USD for a bus the next day. The internet connection in the desert was horrible. We went straight to the bus station and bought bus tickets to Santiago and from there to Puerto Montt, the getaway to Patagonia. The first trip was 23 hours long, then we spent a day in Santiago and continued on a night bus for 12 more hours to Puerto Montt (it’s faster than the day bus). 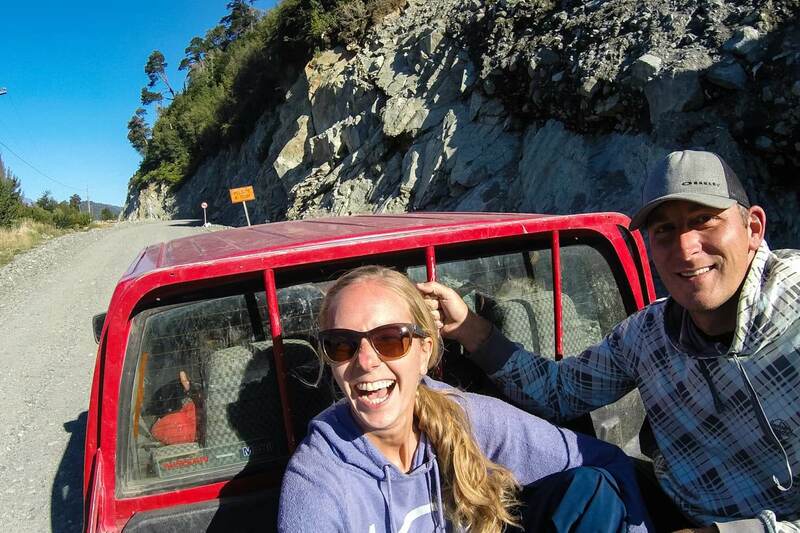 Before your eyeballs are about to fall out, continue reading what bus travel is all about in Chile. We bought tickets slightly more expensive and traveled on full reclining seats with attachable mattress, pillow, blanket, a private TV screen with movie, books, games and we were given 3 snacks during the trip. The bus had very comfortable and wide seats with curtains for privacy, air-conditioning and even a toilet. 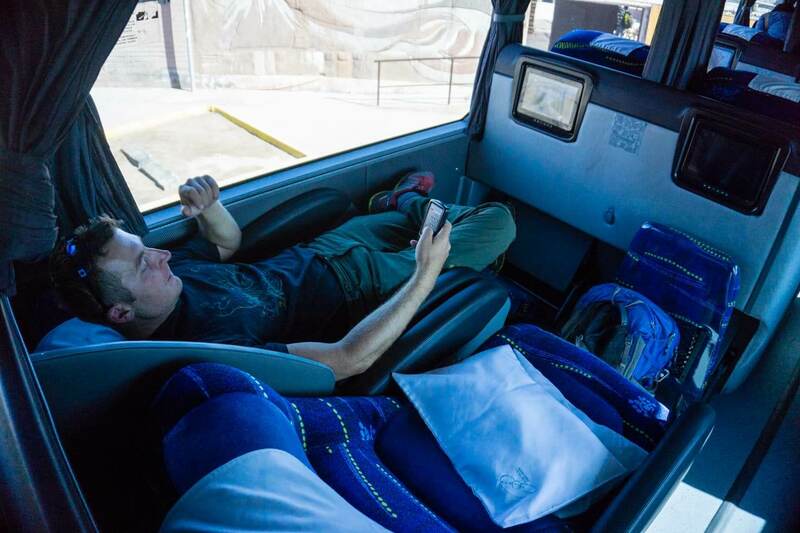 It was the most luxurious travel we had in South America so no need to fear traveling by buses in Chile. Tip: If you’re prone to car sickness, I’d recommend buying Sea Bands. They are acupressure wristbands for travel sickness relief. I used them on countless buses and boats and they saved me many times. Chile is more expensive country to travel around than its northern neighbors, but not the most expensive one in South America (hello Argentina). What you will get for the price though are very high-quality services. On average we spent 60USD/day in Chile per person due to buying lots of camping equipment for Patagonia. If you bring your own gear, you should spend around 50 USD per person. ATMs are widely popular and paying by card as well. We used our credit cards wherever we could to have the best exchange rate and avoid ATM fees. Totally understandable, but to many travelers surprise, everyone accepts Chilean pesos ONLY and no other currency. Withdrawing cash out of your debit card is usually better than exchanging cash, the bank has the best exchange rate. Chile has a huge range of accommodation options everywhere we’ve visited. San Pedro de Atacama, Santiago, Puerto Montt, Puerto Natales, small towns in Patagonia all the way down to Puerto Williams. 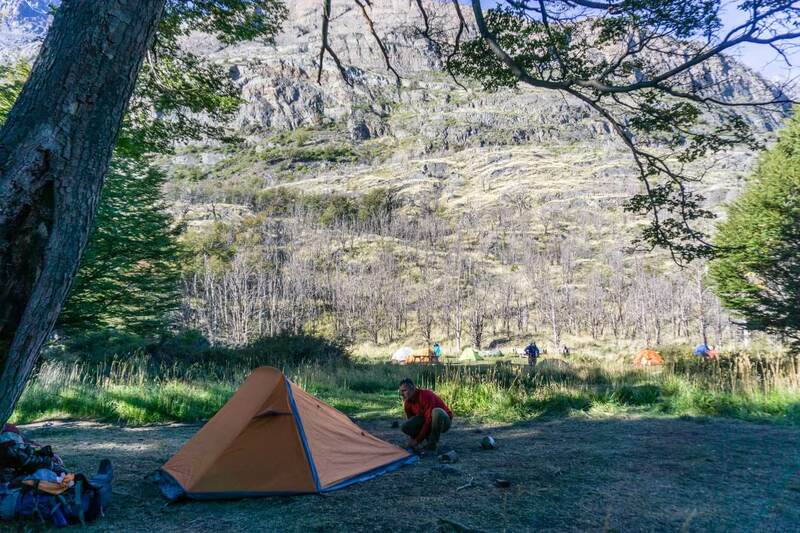 In Patagonia, we used mostly campsites which were usually around 5,000 CLP (7,50 USD). We stayed in hostels when it was too cold or we were in bigger cities. We never booked a campsite in advance but when we booked hostels, we used either Hostelworld or Booking website. When you travel in shoulder season, you might even negotiate a better price as a walk-in. San Pedro de Atacama is very hot, dusty and incredibly touristy. The cheapest hostel we could find was a bed in 6 dorm room for 10,000 CLP (15 USD) and it was crammed with beds and no lockers. The capital Santiago has many colonial – style hostels in huge restored old mansions with high ceilings. They have very spacious rooms, many common areas and many of them have an outside terrace with a pool. 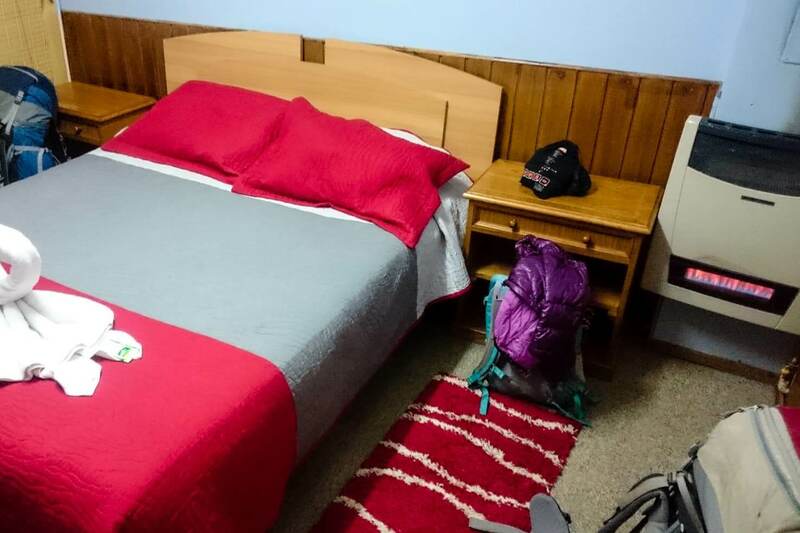 We’ve stayed at Casa Roja in a dorm room for 7,300 CLP (11 USD) per person. In Puerto Montt, we’ve stayed at a local Hospedaje Polz (Bed & breakfast) in a private room for 20,000 CLP (30 USD) including breakfast which we didn’t book beforehand. A local man working at a bus station offered to take us there right after we left the bus. Lucky for us, it was close to the bus station and also the price online was the same as he offered. 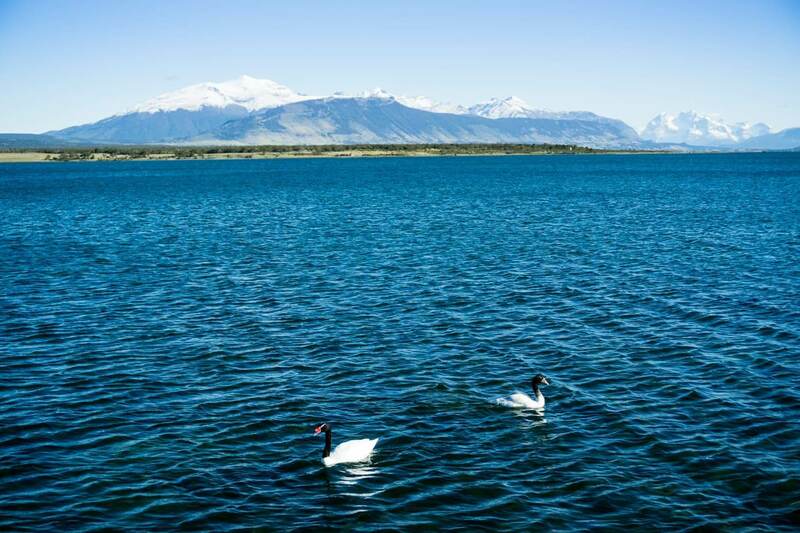 Puerto Natales, from which you visit Torres del Paine National Park, has many great options. We’ve stayed at W circuit hostel in a private room for 20,000 CLP (30 USD). It’s a little cozy place with a very well equipped kitchen and accommodating staff. 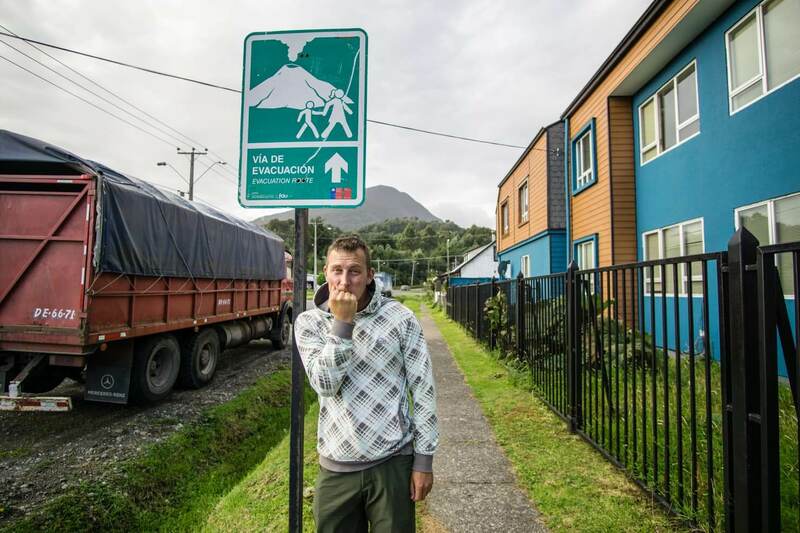 Puerto Williams, the southernmost city in the world, is very tiny and have only a few options. We’ve stayed in hostel Dientes for 12,000 CLP (18 USD) per person including breakfast. Although it was a dorm room, we had it all to ourselves – perks of traveling in the shoulder season. National food is not something we look for intentionally. We usually try something that’s new for us that locals recommend. A Chilean guy who worked as a ranger in a Queulat National Park invited us for dinner. We drank Piscola with his friends, which is just a mix of Pisco and Coke. Pisco is an alcoholic drink which some argue is from Peru and some that it’s from Chile. Honestly, we haven’t looked into it and happily drank with locals in both Peru and Chile. Our new friend drank a little too much and I was left alone to prepare Sopaipillas, deep-fried pastries made from pumpkin. I’m sure it’s a great dish if know how to prepare it or buy it in food stalls. We accidentally stumbled upon delicious donuts on the gas station in the middle of rural part of Patagonia. They reminded us Slovak donuts we used to eat so often as kids. In Patagonia, you will see a lot of Calafate berries growing on the bushes. They are delicious fresh, as a jam or a liquor. The legend says that anyone who eats Calafate berries will return to Patagonia. And now I need to mention the most important food – the buns, or any fresh pastry. Thanks to German immigrants, the pastry they make in all of Patagonia was the best we’ve ever had in South America. Latin American Spanish in your pocket – we also carried a small book with key phrases and words for communicating in Spanish. The Spanish app we downloaded wasn’t always useful when trying to communicate. I always like to read a book or watch a movie about a country I’m going to visit. It gives you more insight into the culture and you’ll be even more excited about your trip. The Motorcycle Diaries – both book and a movie tell a wonderful story of two young boys as they travel through South America and open their eyes to the world we live in. This will truly spark your travel wanderlust. This suggested itinerary is for adventure seekers. It will take you through breathtaking & dramatic landscapes of Patagonia all the way down to the remote part known as Land of Fire. You will see countless mountain peaks, glaciers, wildlife and explore life and mountains in the southernmost city in the world. All international flights fly to Santiago, I’ve mentioned above in section 4 ‘Transport around the country’ how you can get from the airport to the city. Santiago is still quite far from Patagonia. 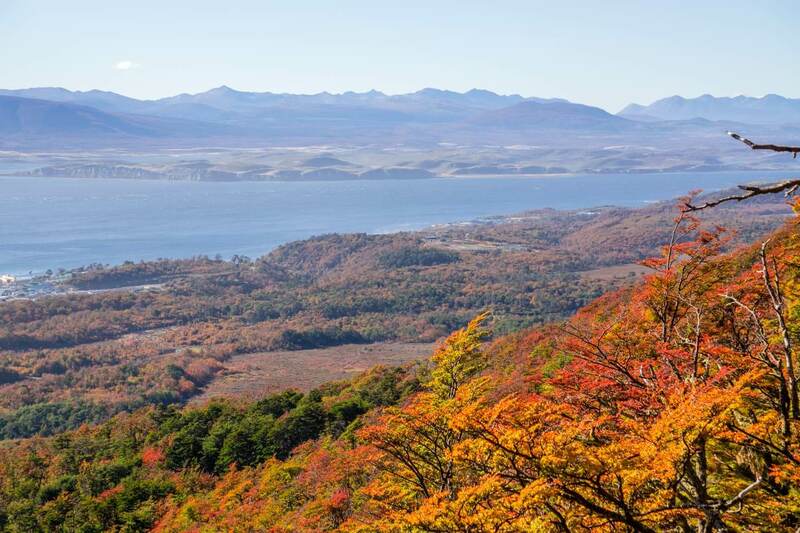 You would need to fly to Puerto Natales (or alternatively to Punta Arenas). Book your flight as soon as you can, ideally on the same day or the next one. 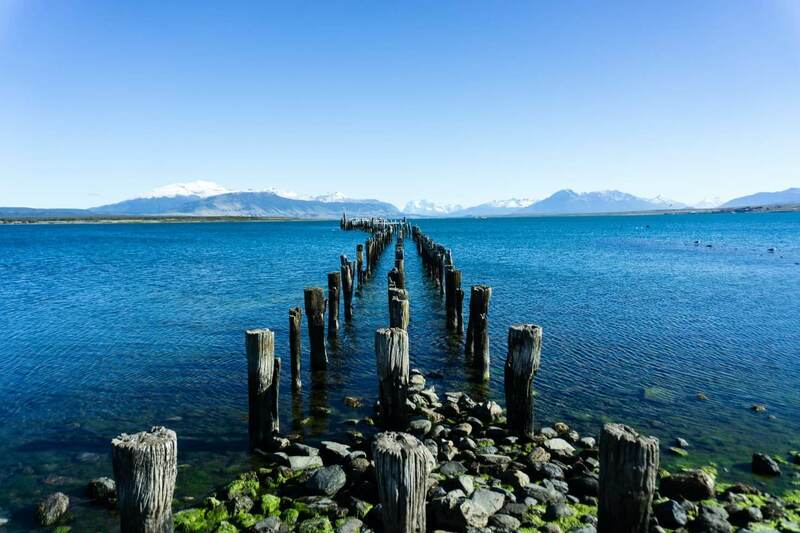 Depending on the day when you can make it to Puerto Natales, either explore Santiago the first day or at the end of your trip. The airport in Puerto Natales only operates during the high season. If you’re planning to come outside of December-February months, you will need to fly to Punta Arenas. There is a direct bus from Punta Arenas airport to Puerto Natales, it departs 7x a day, costs 10 USD one way and takes about 3 hours. You can purchase the ticket online on their website. 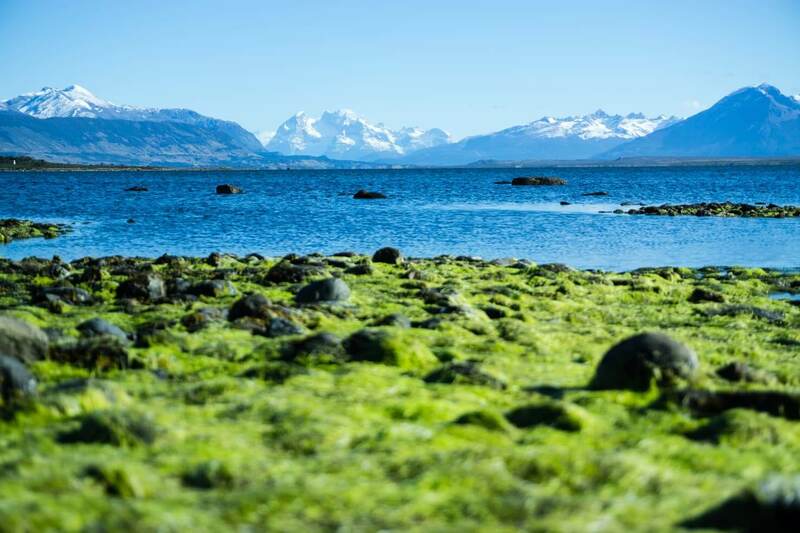 Puerto Natales is the main hub for all the travelers visiting Torres del Paine National Park. You can find here a big supermarket with all the food you’ll need for your trek, many outdoor shops if you wish to buy something and rental places for any gear you might need but didn’t bring with you. If you’re new to trekking, I’d recommend visiting Erratic rock hostel for their daily seminar at 3pm. 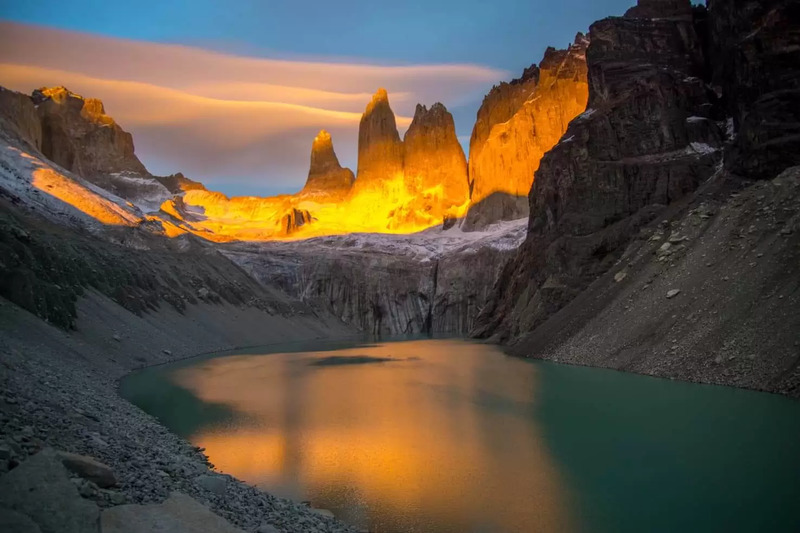 They can advise you on the different options you can trek, have a rental shop and also sell bus tickets to the entrance of Torres del Paine National Park. After you bought all the food for the trek, booked campsites (more on this below) and have all the gear, you can either go for a walk by the ocean or visit a nearby Milodon Caves (reachable either by car, taxi or bike). 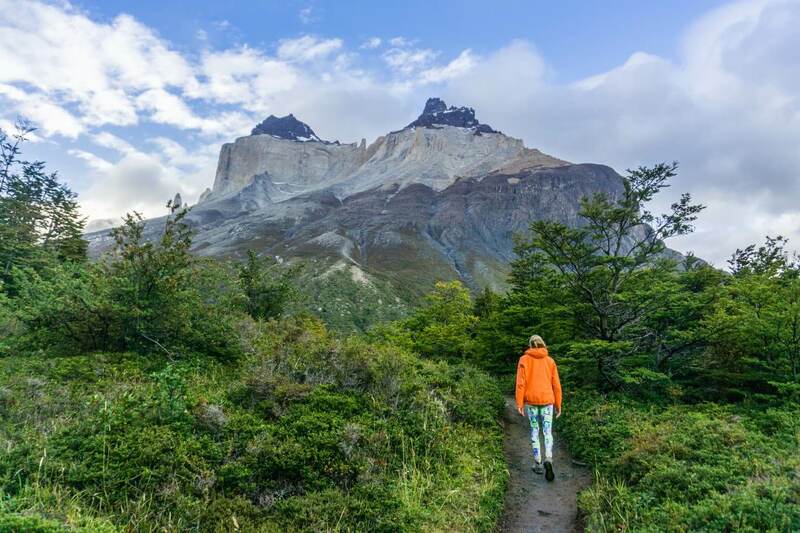 This is probably the most popular trek in South America, and reasonably so, as you’ll see yourself. During only 5 days, you will trek through several valleys in one of the most beautiful places on Earth. If you don’t want to trek, you can rent a car, explore the park and go day hiking. But let me tell you – you will be missing out. I’m confident everybody can finish the trek (as long as you live a somewhat active lifestyle). The trail on W trek covers 80km through the national park with slight elevation. The trail is so well-trodden that you don’t need a map or a guide. It is not a remote backcountry, there are refugios (huts) along the way where you can stay and not worry about carrying any camping gear. You can also pre-book a tent in the campsites which will be already set up for you; you can pre-book a night in refugios with full board and carry only a daypack, or you can carry your camping gear, cook all your meals and cut on expenses. There are options for every fitness level. The more fit you are and able to carry your gear, the more affordable this trek will be for you. Michal and I carried all our gear and cooked food and were able to spend only 144 USD per person for the whole trek, transport, campsites,and food included. We’ve taken advantage of 2 paid campsites and 2 free campsites. For comparison, the guided trek costs around 1,500 USD. Bus transport to Torres del Paine National Park (around 2 hours), then another 30 minutes to Lake Pehoe shore and a boat will take you across the lake where the W trek starts. You’ll start trekking around noon to the Grey Glacier ranger station/campsite. It’s along the Grey Lakeshore with a view of the glacier and very scenic, around 11km. 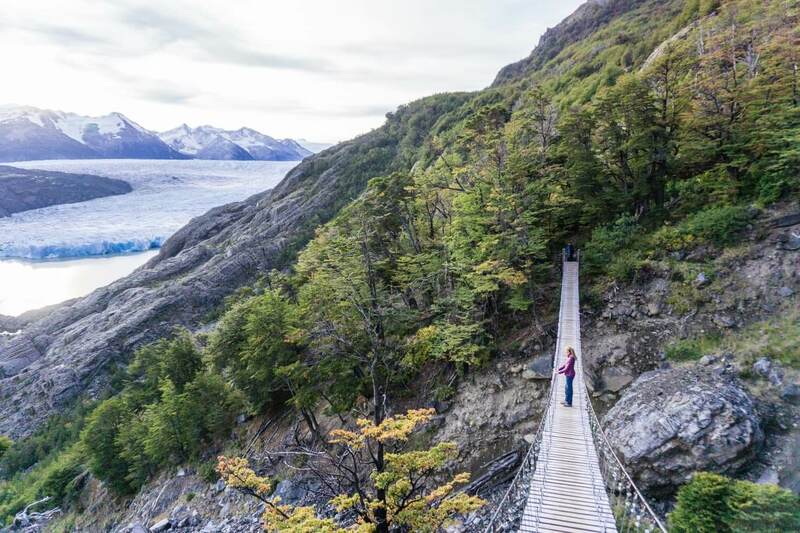 It’s worth it to leave your backpack in the tent and continue another few kilometers to the hanging bridge near the Grey Glacier. Trekking to Italiano ranger station. You will backtrack the same route as you trekked the day before. Then continue another 7,5 km to the Italiano ranger station (free basic campsite). It’s quite a tough day as you’ll be still carrying a lot of food but the next day will make up for it. You will pack your stuff and leave your backpack in the campsite as you will be trekking into the Frances Valley (the middle part of letter ‘W’). This part of the trail is quite easy and you will feel weightless without your heavy backpack. 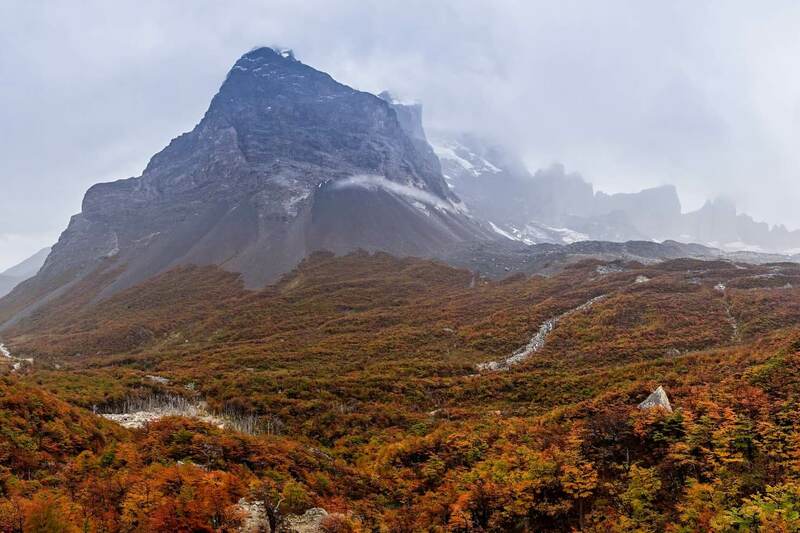 Even though it was raining when we went, the mountain peaks all around us showed us the beauty of Torres del Paine. Once you make it down to the campsite, you’ll take your backpack and continue just a little bit further to Frances campsite (total of 12km for the day). You’re only allowed to stay 1 night at free campsites and Frances has nice facilities with hot showers and a restaurant. This is the longest day where you will trek 24km but most of the trail is flat. Close to the end you will be trekking uphill, pass Chileno Lodge and continue to the Torres camping zone (another free campsite). It will be a grand finish and only 11km trekking. You will wake up before the sunrise (we woke up 6:30 at the end of April) and after a quick breakfast start walking uphill for about 45 minutes to see the famous Towers. The most beautiful part of the trek – it marked the end and we witnessed one of the most memorable sunrises ever. After enjoying the moments to the fullest, you will go back to camp, pack all your gear and head down where a shuttle bus will be waiting for you around 1pm. Another bus will then take you back to Puerto Natales. It will be an unforgettable experience you will cherish for the rest of your life, believe me. I will not go into further details about the trek here because there is a lot to talk about, many rules to follow and a bit complicated booking process for the campsites. After the trek, I recommend going to El Bote restaurant where they make the best salmon with baked potatoes. I imagine you will be tired after the trek. If you didn’t have a chance to go for a massage after the trek, I suggest you go. You won’t believe how a short massage can do wonders and relief your sore body. Then it’s time to move on to Punta Arenas. You can either book your tickets in the booth at the bus station (where you will get off after the trek), or book them online here. The journey takes around 3 hours so you’ll have plenty of time to relax. 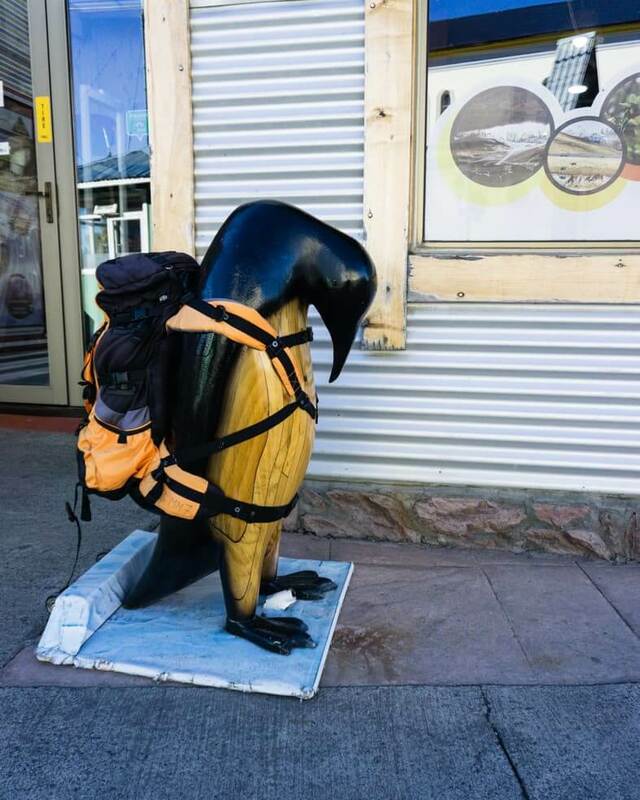 Book an accommodation close to the meeting point for your penguin tour. It’s usually downtown where restaurants and supermarkets are also close by. Punta Arenas is not a very exciting city to explore but it’s a getaway to Southern Patagonia. It’s time to see some wildlife. And not just any wildlife, you will see king penguins! Most people visit Isla Magdalena to see small penguins which migrate from Brazil and Peru to reproduce here for about 3 months a year during summer. In Pingüino Rey Park near Porvenir, you can see the biggest penguins in the world all year round. They are unique species which only live in Antarctica and Tierra del Fuego. From Punta Arenas, you can either rent a car and drive by yourself or book a tour online. Self-drive – there are 2 different options how to get there and both of them require a ferry ride as well. The penguin park has a daily limit of visitors so make sure to book your tickets in advance. The Pingüino Rey Park is open year round Tuesday to Sunday and the entrance fee is 12,000 CLP (18 USD). For more info, check out their website. Tour – includes transport and a guide but not the entrance fee. It costs 55,000 CLP (82USD) per person. Unlucky for us, we’ve visited Punta Arenas during public holidays so we didn’t see them (but made up for it later in New Zealand). Don’t miss a chance of seeing these beautiful creatures! From Punta Arenas, you can fly directly to Puerto Williams. Never heard of it? I don’t blame you, not many people did. Puerto Williams is the southernmost city in the world and part of Tierra Fuego, or Land of Fire. We’ve learned at school that it’s Ushuaia in Argentina but this is not true anymore. 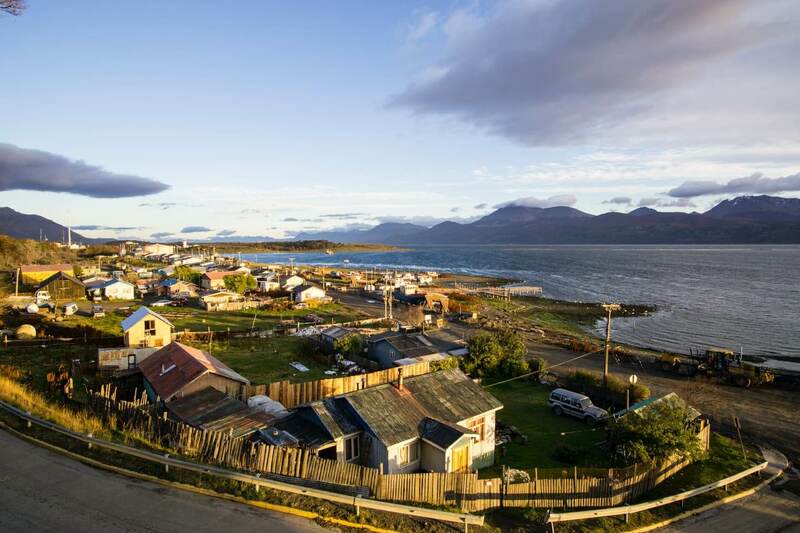 Although Puerto Williams got an exception to call itself city because it’s very small, it’s located around 12km south of Ushuaia. It’s not only the end of the world; it also feels like the end of the world. The plane between Puerto Williams and Punta Arenas flies Monday to Saturday, check this schedule. Another option is a ferry and although the 33-hour ride was very enjoyable, I understand that most people don’t have the time for this. The landscape is very rugged, most of the year has harsh windy conditions but the community living in Puerto Williams is small and welcoming. You can explore the Yaghan campsites, an indigenous tribe of the area and even buy a handcraft from the last Yaghan descendant. There are several hikes in the area, either to the waterfalls or to Cerro La Bandera. It’s a one day hike on the hill above the city from which you see across the Beagle Channel to Argentina. It’s a unique experience to walk the streets of the southernmost city in the world and truly off the beaten path place. On day 12, you will fly back to Punta Arenas, the plane leaves at 11:30am and then catch a flight to Santiago. 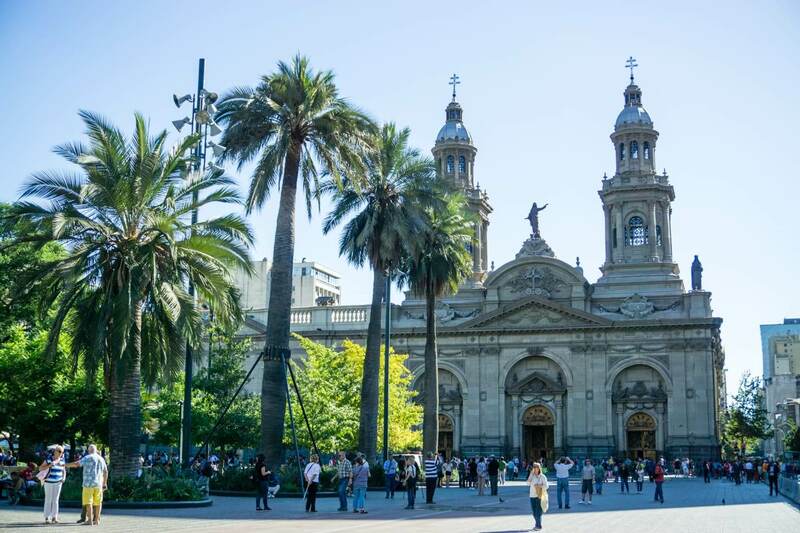 The ideal time to explore a bit of Santiago is at the end of your trip. 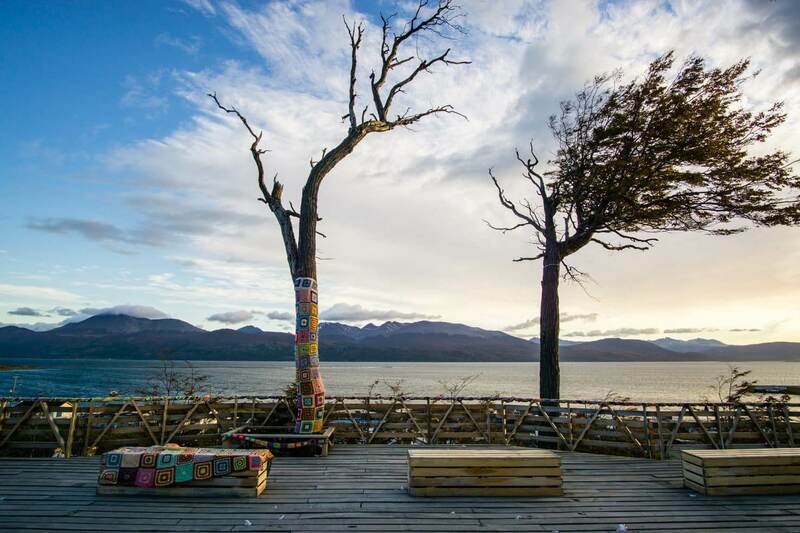 No matter the unpredictable weather conditions you encounter in Patagonia or in Puerto Williams, Santiago is usually sunny and warm. 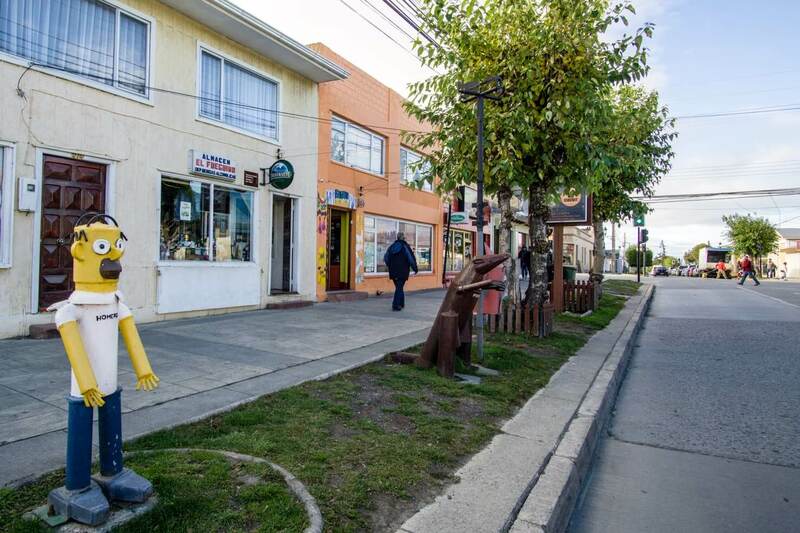 Downtown is alive with street artists and cultural performances, or you can check out a few of the famous markets with traditional Chilean handicrafts. If you’re not a big city fan, you can hit the beach in Valparaiso, a colorful city on Chile’s coast, just 2 hours by bus from Santiago. 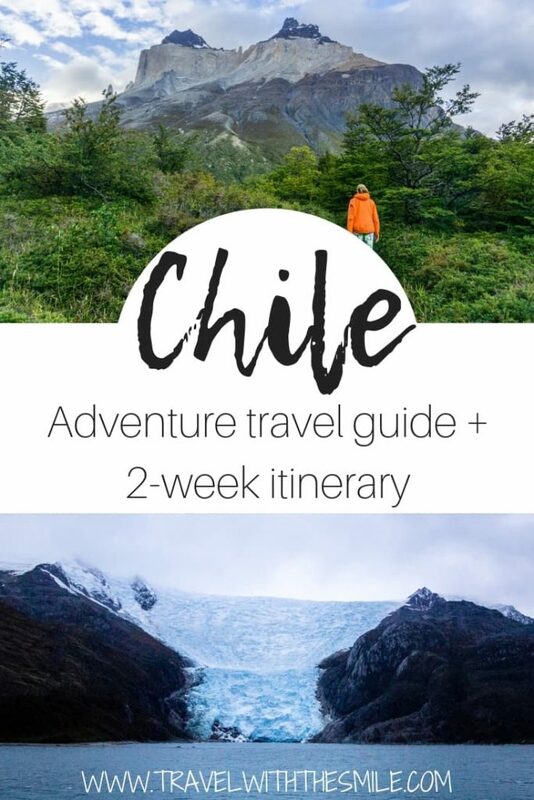 Are you ready to visit Chile? Let us know if you have any questions in the comments below.